What a long day that was! We came back at 1pm yesterday afternoon and after nearly 14 hours of play we've finally crowned a winner. 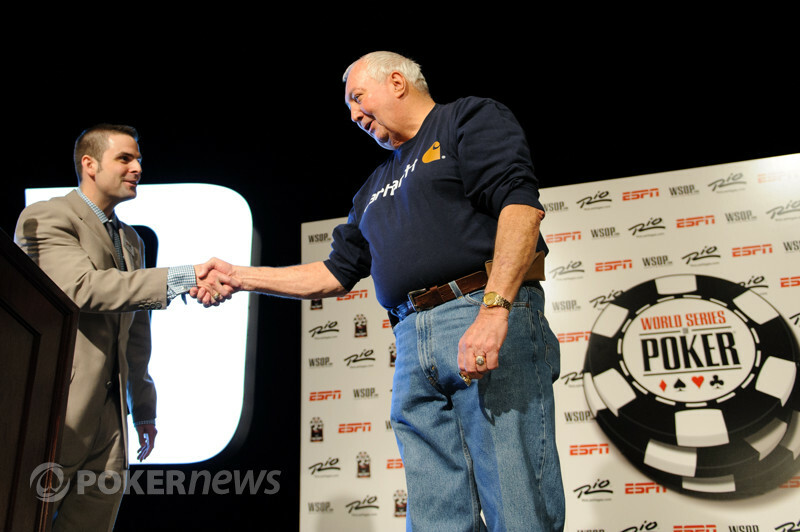 Herbert Tapscott from Birmingham, Alabama defeated the formidable Gavin Griffin after a two-hour heads up battle. There was just six minutes left of today's allotted play when the decisive hand (explained below) played out. The 71-year old Tapscott prize is more than ten times that of his previous win. Not only did he have to get past Griffin, he had to navigate his way past the talents such Allen Bari, Dutch Boyd, and John Racener. A lot of players would had bets on those three in the sports-book this morning. Griffin will be hugely disappointed as the Triple Crown holder was desperate to add to the first bracelet he won as a 22-year old. Tapscott was nearly 50 years older when he managed the same fete. This is PokerNews signing off another event here at the Rio. We're absolutely shattered and are heading straight to bed. Be sure to tune in to out colleagues tomorrow where others will be looking to make their own poker history. Here at nearly 3am Herbert Tapscott made his own, and in the fall of his life. Many congratulations from us all. And then it was all over! Within a couple of hands Herbert Tapscott found a way to end Gavin Griffin's resistance and we've got ourselves a winner. Griffin raised to 200,000 from the button and Tapscott made the call. The flop came down and Griffin was all in blind for his final 65,000 chips. Tapscott made the call and showed against Griffin's . The turn was the and the river the giving Tapscott the winning hand and the gold bracelet! Griffin just limped on the button and Tapscott checked. The flop was and Tapscott check-called 100,000. The turn was the and both players checked. On the river the hit the board and Tapscott bet 200,000. Griffin called and had to muck when Tapscott showed his . Griffin is getting seriously short but we only have 10 minutes left in the day. Could Tapscott finish it or are we coming back for more tomorrow? A big pot went Herbert Tapscott's way and it's put Gavin Griffin in the danger zone. 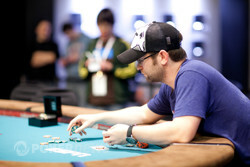 The pot was limped to a flop where Griffin called a 100,000 bet to see the . Tapcott checked-raised at this juncture but Griffin wasn't to be shifted. The river fell and Griffin made a reluctant sounding call. Tapscott showed him and scooped as Griffin mucked. Griffin raised the button to 200,000 and Tapscott called. The flop came down and both players checked. The turn was the and Tapscott lead out for 200,000. Griffin called and the river was the . Tapscott checked the river and Griffin bet 200,000. Tapscott called and mucked when Griffin showed his for the king high flush. 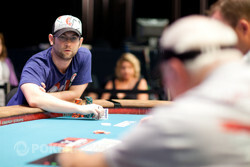 Gavin Griffin has taken control (again) of this lengthy heads up battle. 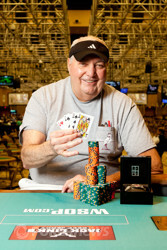 He opened from the button and Herbert Tapscott defended to see the flop where he check-raised Griffin's c-bet. Call. The turn came and Griffin called a 200,000 bet. The river fell and Tapscott check-called a 200,000 bet. "Straight," said Griffin who scooped with . It's been a couple of hours since Gavin Griffin was the tournament chip leader, but he's back there again. He raised when Herbert Tapscott called on the button. Tapscott called, and called a c-bet on the flop. 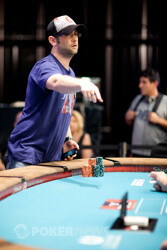 Both players checked the turn before Tapscott folded to a 200,000 bet on the river.